Justin Stofferahn is a policy specialist for the State of Minnesota and is a new Policy Fellow for Growth & Justice. His work focuses on fiscal and economic issues. He also has policy experience from his work in the offices of the Illinois Governor and Lt. Governor. The biggest story in economic development right now is the bid to secure Amazon’s second headquarters and the estimated 50,000 high-paying jobs that will be located there. States and cities across the country recently submitted pitches to the tech giant, and Minnesota was among the suitors. In its attempt to add to the ranks of Fortune 500 companies that call Minnesota home, the state likely mentioned CNBC’s recent ranking of Minnesota as the fourth best state for business. The cable network cited quality of life (second), education (second), infrastructure (fifth), and technology and innovation (ninth) in its rating. A low unemployment rate and high median income further a portrait of a healthy dynamic economy. Beneath these rosy rankings, is data that show the current economic recovery has been a boon to Minnesota’s corporate giants, at the expense of small businesses and entrepreneurs.1 More people than ever work at large companies and Minnesota has never been so dependent on its biggest businesses for economic growth. Meanwhile, new firm formation is the lowest it has been in recorded history and small businesses have yet to recover to pre-recession strength. Luring Amazon, which has generated antitrust concerns among academics, activists and policymakers, will do nothing to reverse these trends. Jeff Bezos may well see the power of the Minnesota Miracle, but small business owners, entrepreneurs and workers are still waiting for one. Media stories about a booming Twin Cities tech sector obscure the fact that entrepreneurship is lagging in Minnesota. The recession further accelerated a troubling decline in startups that has been taking place for decades (Chart 1). 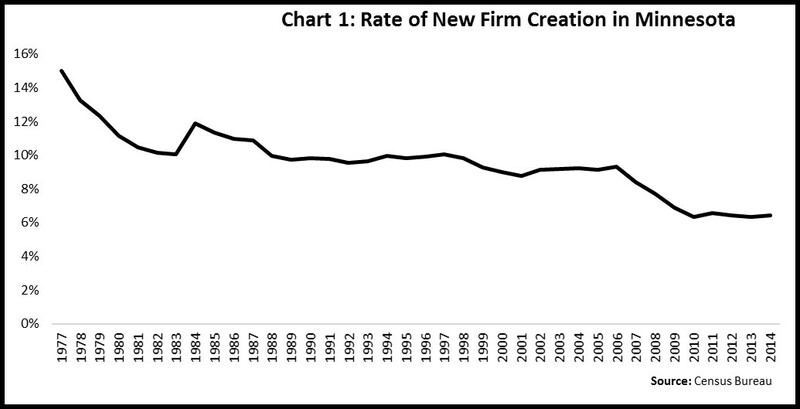 While the annual rate of new firm formation has flattened in recent years, it has been on a long-term decline since 1977 dropping from just above 15 percent in 1977 to below 6.5 percent in 2014. This long-term decline accelerated during the recession as the rate dropped from 9.32 percent in 2006 to 6.33 percent in 2010. The loss of startups in Minnesota has weakened the state’s economic dynamism and significantly curtailed job growth. 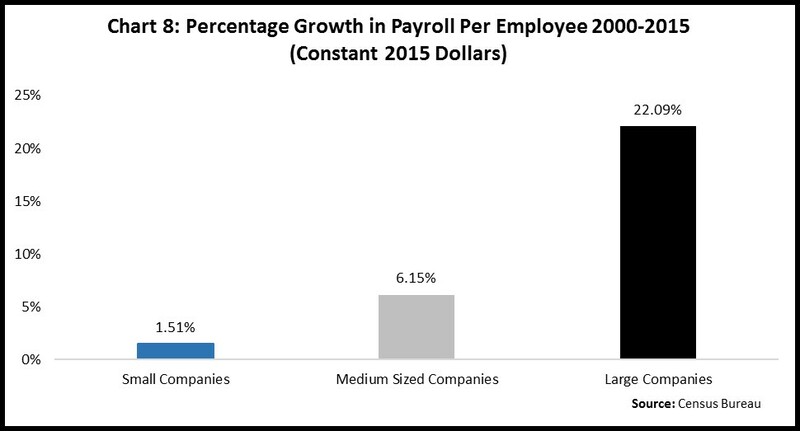 In addition to job growth, startup companies are key to driving productivity growth, which in turn helps drive wage growth. Recent research estimates that new firms productivity grows by 15 percent on average, but that by year five that growth is essentially zero. 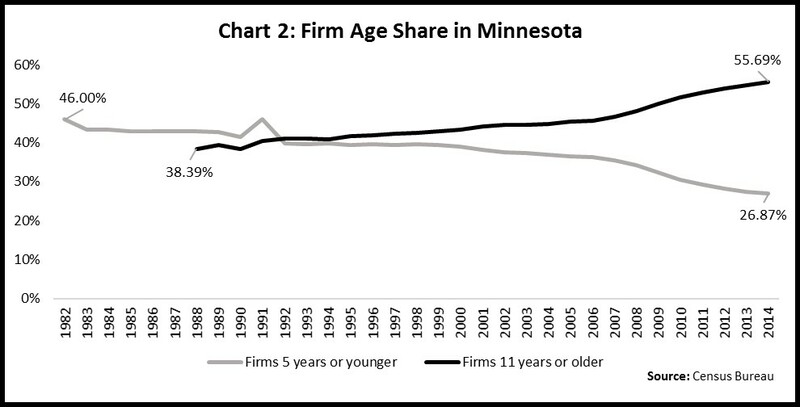 The drop in startup rates in Minnesota has dramatically reduced the number of firms five years and younger from 46 percent of all companies in 1982 to less than 27 percent in 2014 (Chart 2). This predictably increases the share of firms that are older. Companies that are 11 years or older accounted for just over 38 percent of all firms in 1988, but has increased to 55 percent in 2014 with a particular acceleration during the Great Recession. Instead of an economy anchored on job-creating productivity-enhancing young firms, Minnesota has shifted to a reliance on job-destroying unproductive old incumbent companies. This is not to suggest that policymakers should seek to punish older companies whether a decades-old family business or a major corporation. Rather, just as Minnesota’s economy has benefited from a diverse mix of industries, a diverse mix of business ages and sizes are key to a thriving, dynamic economy. The Great Recession’s acceleration of the entrepreneurial decline also left Minnesota with a shrinking pool of companies as startup totals have dropped below firm closings for the first time (Chart 3). From 1977 to 2007 startup totals outpaced firm closings by an average of nearly three percentage points, but between 2008 and 2014 the startup rate was essentially equal to the firm closing rate. This has left Minnesota with nearly 5,000 fewer firms than in 2007. 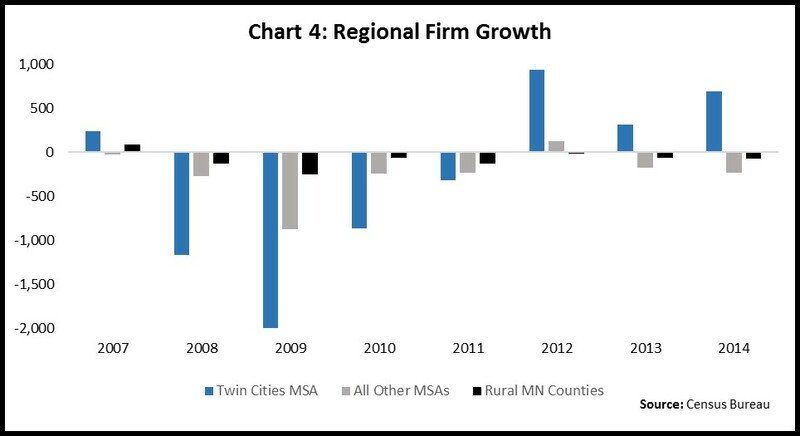 Furthermore, the state has become entirely dependent on the Twin Cities for net firm growth (Chart 4). The shifting nature and levels of entrepreneurship have driven this reliance. In 1977 Twin Cities startups accounted for approximately 52 percent of all Minnesota startups, but in 2014 had grown to roughly 70 percent of the state’s share. Minnesota is not alone in experiencing this decline in young firms, but academics are still trying to pinpoint the cause. One potential culprit discussed recently is increased economic concentration as large firms can quickly buyout potential competitors, not to mention the would-be entrepreneurs that are discouraged by the power and profitability of ever-larger incumbents and never even attempt to start a new business. In Minnesota big businesses have been thriving more than ever before and are transforming the state’s economic landscape. Small businesses are a favorite constituency of policymakers on both sides of the aisle and for good reason3. Nationally small firms account for 98 percent of all businesses, employ 34 percent of workers and create a third of new jobs. The Great Recession dealt a blow to Minnesota’s small businesses and the slow recovery has done little to improve their fortunes. The financial crisis reduced the ranks of Minnesota’s small business community by over 6,400 companies, and in 2014 the state still had 5,170 fewer small firms than before the recession. Meanwhile, medium sized and large businesses have surpassed their 2007 levels. 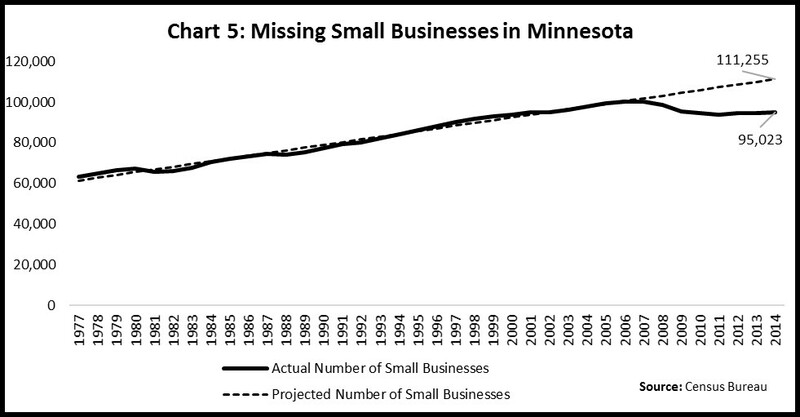 Had the number of small businesses in Minnesota grown in line with the trend from 1977-2007, there would be 16,232 more small businesses (Chart 5). Just as the decline in entrepreneurship has allowed old incumbent companies to gain a greater foothold, Minnesota’s missing small businesses have shifted employment to the largest companies (Chart 6). The percentage of workers employed by small businesses in Minnesota has dropped by two percentage points since the start of the Great Recession and in 2014 small firms employed 35,000 fewer Minnesotans than before the financial crisis. The drop, however, is part of a long-term trend that has seen small business employment drop from over 41 percent of all workers to roughly 32 percent. Large businesses on the other hand completely absorbed the two percent shift in employment while the share at medium sized firms remained flat. Long-term, big companies have grown their share of employment from just over 40 percent in 1977, to nearly 47 percent in 2014. Prior economic recoveries have benefited Minnesota’s small businesses, but recent economic growth has disproportionately benefited the state’s economic giants (Chart 7). The available data spans four recessionary periods, the steep recessions of the early 1980s, the milder downturn of the early 1990s, the tech bubble at the turn of the century, and the most recent Great Recession. Minnesota lost nearly 1,500 small businesses between 1980 and 1981, but their numbers quickly rebounded and surpassed pre-recession peaks by 1983. In the recessions of the early 1990s and 2000s, the number of small firms in Minnesota actually continued to grow through the economic declines. 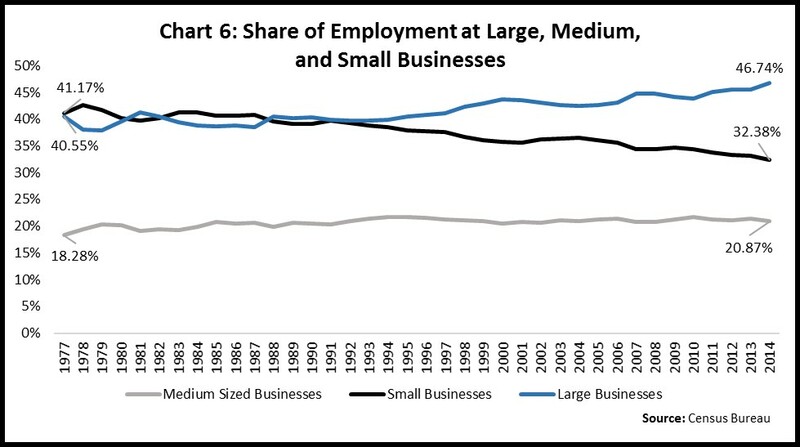 Employment at small businesses followed similar trajectories. During the recovery from the 1980 recessions, employment at small and medium sized businesses bounced back more quickly than at large companies, while the 1990 and 2000 recessions only saw small business job growth slow down before accelerating during the ensuing recoveries. In 2014 while overall employment in Minnesota has moved above pre-recession levels, employment at small businesses is still below 2000 levels. 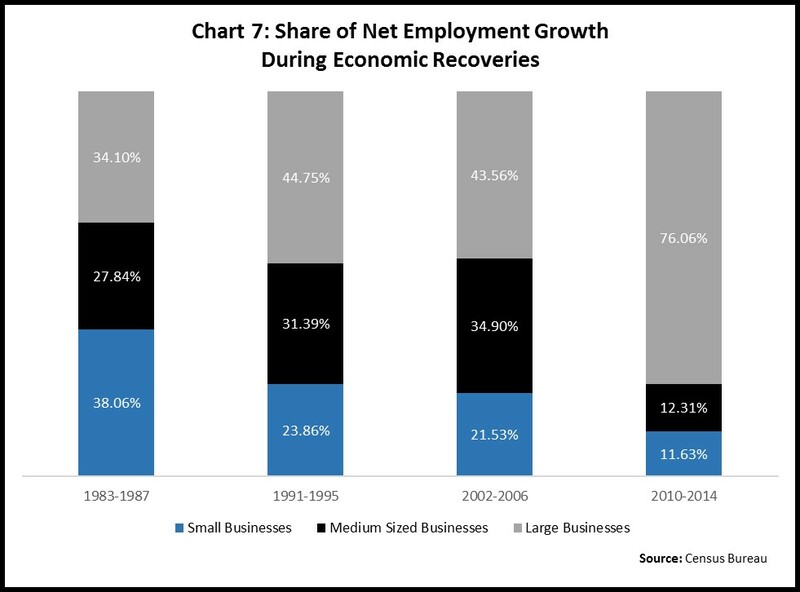 While small businesses have created fewer jobs in each successive economic recovery, the current recovery has done little for small companies. Another way to view this growing separation between small and large businesses in Minnesota is through the wages and benefits that companies are able to offer.4 Since 2000 the payroll per employee at large companies has grown much faster than the average wage at small and medium sized businesses (Chart 8). When it comes to benefits, the health policy nonprofit Kaiser Family Foundation has found that only 24 percent of firms with fewer than 50 employees offered health insurance to workers in 2016 compared to 95 percent of all other firms. While this “two-speed” recovery has hurt small businesses throughout the state, the challenges are particularly acute in rural Minnesota.5 The well told story of economic decline in rural communities is that deindustrialization drove out major employers that anchored employment and economic growth in small towns. The data reveal a very different truth; that rural Minnesota is more reliant on big business than ever before. Since 2010, employment in rural Minnesota has grown by 18,277, although overall employment in 2014 remained below its post-recession peak. The positive job growth was entirely the result of large companies as small and medium-sized firms collectively shed nearly 2,500 jobs during this period. Huge firms, those with over 10,000 employees, were responsible for 43 percent of the net job growth in nonmetro Minnesota from 2010-2014, further revealing a rural economy dominated by the business community’s largest one percent. The job loss at rural small businesses leaves communities with fewer small business employees than in 1995. Along with employment, the total number of rural small businesses in Minnesota has failed to rebound during the recovery. In 2005 the number of rural small businesses peaked and has been in near constant decline since (Chart 9). This sluggishness among rural small businesses has contributed to overall employment challenges in Minnesota’s small towns as non-metro employment totals in 2014 had yet to recover to precession levels. The decline in entrepreneurship and loss of small businesses coincides with a weak labor market that has failed to produce increased wages. While Minnesota’s low unemployment rate has spurred talk of a looming labor shortage, there is evidence the state has not yet reached full unemployment and barriers remain to providing everyone access to a good job. The first indicator is the state’s depressed wage growth. A tightening labor market should spur increases in wages, but median hourly wage growth has been sluggish throughout the recent recovery and despite recent growth in median household incomes, 2016 levels remain below inflation-adjusted peaks (Chart 10). 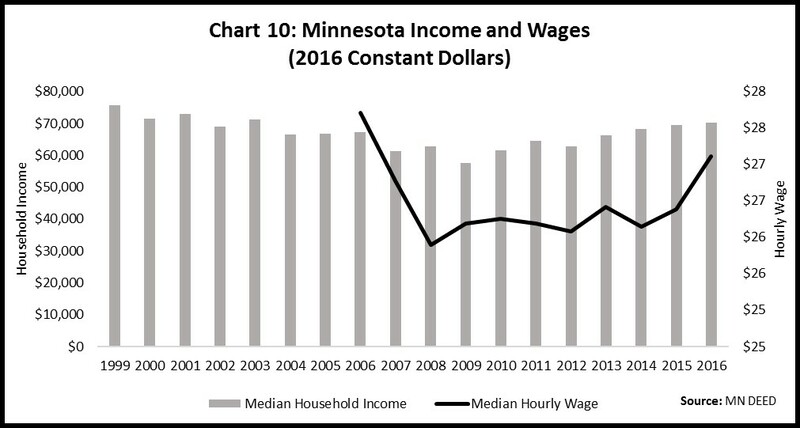 Depressed wages reveal Minnesota’s unemployment rate does not capture the true health of the labor market, but several alternative indicators help paint a fuller picture.6 Despite a low topline number, unemployment remains high for African Americans (8.5 percent) and Hispanics (5.3). A broader measure of unemployment that includes underemployed and discouraged workers reveals that seven percent, or nearly 215,000 Minnesota workers, have yet to feel the full benefits of the recovery. 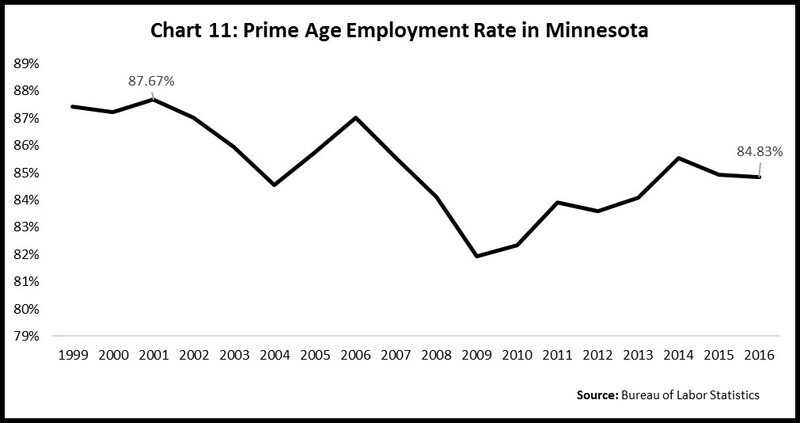 These data only capture those Minnesotans that have remained in the labor market. The weak recovery has left Minnesota’s prime-age employment rate (the percent of 25-54 year olds that are employed), which is a strong indicator of wage growth, well below recent peaks (Chart 11). All of this evidence suggests Minnesota’s economy is in need of the additional jobs a more robust environment for entrepreneurship and small businesses would provide. Along with the negative economic side effects, this concentration is a challenge to our democracy. Big corporations have immense power within the political system, which will only grow along with the companies. The Minnesota Chamber of Commerce and Minnesota Business Partnership spent $3.6 million lobbying the legislature during the 2016 session and another $2.4 million through their respective political action committees on 2016 legislative races.7 In addition, the Fortune 500 companies headquartered in Minnesota employ government relations staff and contract lobbyists to make their own individual voices heard in St. Paul. This stacks the deck against small businesses and entrepreneurs who get lip service from elected officials but little else. Increased economic concentration is a nationwide trend that requires additional research and federal action, but Minnesota can act to help entrepreneurs and Main Street companies. The state can reduce barriers to entry in certain industries, rework the focus of economic development programs, increase access to lending, and take pre-emptive action to keep regional markets from concentrating in the first place. A later post will explore policy solutions that can protect competition in Minnesota. 1 Data is from the Census Bureau’s Business Dynamics Statistics (BDS) series. The data excludes self-employed individuals, most government employees, and agricultural production workers. 2 Author’s calculation using historic average of 6.24 jobs per startup company from 1977-2014. 3 The federal government defines small businesses as firms with 500 employees or fewer. This article categorizes firms with fewer than 100 as small businesses, firms with 100 to 999 employees as mid-sized businesses, and firms with 1,000 employees or more as large companies. 4 This section utilizes data from the Census Bureau’s County Business Pattern (CBP) data. This data is from establishments instead of firms. Establishments are individual locations that could all be under the umbrella of a particular firm. So for example, individual Target stores are each counted as establishments, although they are all part of the same firm. This means that some small establishments could be part of the largest firms. 5 Rural Minnesota consists of Minnesota’s non-metro countries. These are the 60 counties not part of a Metropolitan Statistical Area (MSA). Minnesota’s MSAs can be found here.